The Fallen Series is one of my absolute favorite paranormal romance series out there. Book Four in this series came out in May and is just as fantastic as the other three. Angels, shifters, vampires and demons. 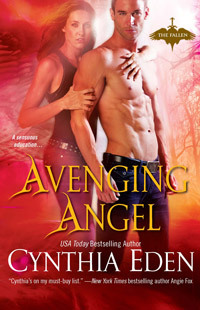 You get them all in Avenging Angel by Cynthia Eden. They are dark, edgy, mouthy, passionate and are ready to die to save those they love. Something different about this book in the series is that the angel, Marna, is not Fallen at first. Her wings were cut off so she doesn’t have a choice about living on Earth. She is also being framed for murder by someone and she finds that Tanner Chance, a panther shifter/cop is the only one she trusts. Avenging Angel pulls you in from the beginning and doesn’t let up until the last page. It is an exhausting book in all the good ways. One scene near the end actually brought me to tears because of the emotion. The characters of Tanner and Marna, along with Cody, Riley, and others are very well written. They each have their own personal story and issues to overcome which makes the overall story that much more interesting. I, being a lover of all things Sammael from Angel Betrayed, was so happy that he made a few appearances and had me laughing or rolling my eyes at him. I am not so sure about Bastion yet, but I wasn’t sure about Sam or Az either in previous books so we’ll see what he is like in the future. I really hope that there is a story about Cody, Tanner’s brother. He is such a great character. Cynthia does a really nice job of the romance and suspense in Avenging Angel (one of the things I love about her stories – there is always a lot of suspense). While the intimate scenes were hot, they did not detract from the flow of the story. There is such passion between Marna and Tanner. It may seem primal and physical at first, but there is so much more going on here. Otherwise, why would they both be willing to die for the other one? As for the suspense aspect, there is quite a mystery going on to figure out who is taking the face of Marna and Tanner while killing. You don’t know who to trust. When I first thought I knew who the villain was I kept thinking to myself, “Did Cynthia really make it this easy?” Many things were pointing to this one person, but alas, it was not who I suspected until it was revealed to me. Avenging Angel is a fantastic story that engages the reader from the first page, pulls at all of your emotions and doesn’t let go until the last page. If you are looking for a fast paced, dark, hot, paranormal romance, I highly recommend Avenging Angel.